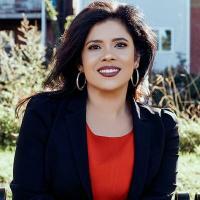 Alejandra St. Guillen, director of Boston Mayor Martin Walsh's Office for Immigrant Advancement, will run for an at-large Boston City Council seat, she announced Wednesday. In an email, St. Guillen said she hoped to "address growing inequalities, from income to public safety to education." "I was born and raised in Mission Hill and have dedicated my life and professional experience to the people of Boston," St. Guillen wrote. "As a parent, wife, and public advocate, I understand firsthand the opportunities for prosperity and mobility in our great city. I also understand the multi-faceted obstacles that deny these opportunities to many." St. Guillen previously was executive director of ¿Oiste?, a statewide Latino civic and political organization. A graduate of Boston Latin School, she started her career as a teacher for four years in New York City and Boston. She holds a B.A. in economics and African-American studies from Wesleyan University and master's in education from City College of New York.